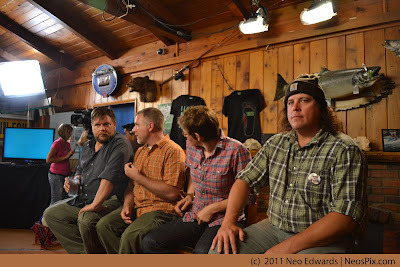 The following three articles are updates for Michigan Town Hall meetings conducted by the crew at Finding Bigfoot. To catch up to the news before the town hall click the following link to read our entire Michigan Bigfoot news coverage (this includes the Bigfoot that favors blueberry bagels). In chronological order we will repost the three articles that address the town hall meeting held in the Houghton Lake area. The town hall meetings have become a staple of the television series, it is set up as an opportunity to find encounters to investigate. Although sometimes they find new encounters, it may be interesting to know, some of the investigations are already pre-picked and planted in the town hall. Its TV, you don't complain when the dish is pre-cooked in the oven during a cooking show. Bigfoot in the Big Mitten? Producers from the Animal Planet TV program "Finding Bigfoot" have been filming in the Houghton Lake area this week, looking for signs of Sasquatch. Phil Shaw, a member of the Bigfoot Field Researchers Organization, said there have been more than 130 Bigfoot sightings in almost every county in Michigan, and they got some leads at a town hall meeting April 5 at the Houghton Lake Playhouse. "I'd say there were at least 350 people at the meeting," said Shaw, 69. "Many people had stories that they shared: My favorite was from a lady who lives south of Houghton Lake that actually had been able to record 'whoop howls' from a Bigfoot. "They only howl on a limited basis, so that was very rare and impressive." Bigfoot is a general description of a huge, hairy, ape-like — and what most believe to be mythical — creature usually covered in dark brown or reddish hair. They are usually described as having a huge brow ridge, a gorilla-like face, a jaw-dropping aroma and reportedly have left footprints as large as 24 inches long and 8 inches wide. According to Shaw, the average male Bigfoot is 8 feet tall and weights 800 pounds; females are 6 feet tall and a petite 600 pounds. 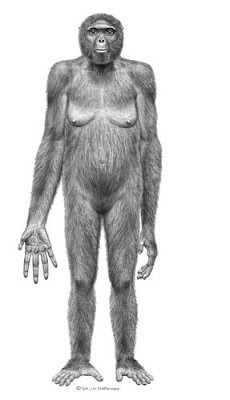 Many scientists have largely dismissed the idea of an ape-like hominid living in the backwoods of America. Tim Barnum, news editor for the Ogemaw County Herald, says there are many reports of the big guy in the area, but often people keep the sightings to themselves rather than face potential ridicule. "I've heard stories, but personally I've never seen one," Barnum said. "Then again, I'm not much of an outdoorsman." 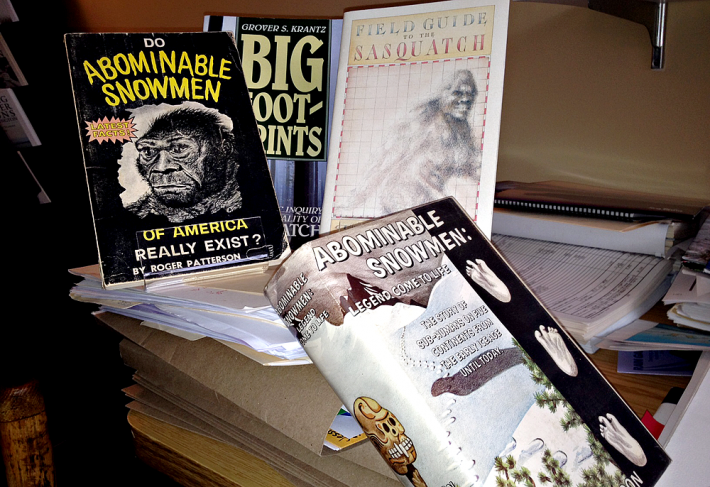 For many Americans who want to believe in Bigfoot, the truth is out there. "People might think it's crazy to believe in Bigfoot, but there have been sightings like this for years in every culture all over the world," Shaw said. The episode featuring the search near Houghton Lake will run sometime this summer, Shaw said. 'Finding Bigfoot' Takes Search To Houghton Lake, Mich. The stars of a popular cable show are combing the woods around Houghton Lake, Mich., for signs of the the giant bipedal ape-man known as Bigfoot. Animal Planet's show "Finding Bigfoot" is filming in the area and drew 350 people to an April 5 town meeting held to gather clues about the whereabouts of the elusive cryptid, according to the Detroit News. Phil Shaw, a member of the Bigfoot Field Researchers Organization told the News that some of those who showed up for the meeting shared stories of personal encounters. "My favorite was from a lady who lives south of Houghton Lake that actually had been able to record 'whoop howls' from a bigfoot," he said. "They only howl on a limited basis, so that was very rare and impressive." Shaw's organization has records of around 140 Michigan Bigfoot sightings since 1910 -- including a November 2011 report by a hunter who heard "resonant vocalizations and bipedal movement" while camping in Roscommon County. "Michigan has been a hotspot for sightings since the 1960s, especially areas like Sister Lake and Monroe, where there were reports of very aggressive creatures and people being attacked," said Loren Coleman of the International Cryptozoological Museum in Portland, Maine. Coleman said the high number of sightings makes sense because of Michigan's extensive wilderness. "It's in the boreal forest, the heavily tree-covered area that goes from the Pacific Northwest across the U.S.-Canada border to Maine, but it has more sightings than other places because there are more people," he said. "You need people to see Bigfoot and Michigan has a higher population than, say, the Dakotas." The Houghton Lake episode of "Finding Bigfoot" will air on Animal Planet this summer. David Moye contributed to this report. In terms of hotspots for giant, bipedal ape-men, Michigan might not come to mind, especially compared to states in the Pacific Northwest. But the mitten state is not without its share of alleged Bigfoot sightings. According to the Detroit News, some high-profile Bigfoot hunters are paying visit to Michigan with camera crew in tow, hoping to catch a glimpse of the elusive cryptid. Phil Shaw, a member of the Bigfoot Field Researchers Organization, said there have been more than 130 Bigfoot sightings in almost every county in Michigan. The episode including the Michigan investigation is set to air sometime this summer, the Detroit News reports. NPR: Why Did Bigfoot Grow Up in the Northwest? Below is a reprint of an article that was posted on NPR's website titled, "Why Did Bigfoot Grow Up in the Northwest?" This is a part of the "I Wonder Why..." weekly series that covers attributes in the Northwest that locals find endearing, odd, even irritating. The idea of a giant, ape-like creature that hides in the woods and might be related to humans has been around for centuries. Why has this “myth” endured in the Northwest? Is it because Bigfoot is really here? Or, is it because it’s the kind of wild alter ego Northeasterners love to imagine for themselves? Now, the Internet has pushed the popularity of Bigfoot to new heights, with sightings compiled on dozens of websites. There is even a Sunday night cable TV show:Animal Planet’s “Finding Bigfoot” launched last spring and is now one of the channel’s top three series, ever. 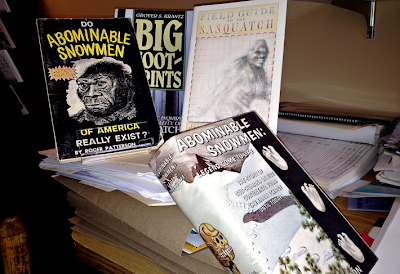 His guidebook surveys scientific arguments for and against the existence of Sasquatch. The first modern “evidence” that there might really be an ape-like creature living in the forests of the Cascade Range appeared 45 years ago. It’s a grainy, black and white film from 1967 of an alleged Bigfoot sighting at Bluff Creek in Northern California. It shows a female Sasquatch striding along a creek bed. At one point, she turns and looks at the camera. The film has created a lot of believers. Others remain highly skeptical. “It could be anything,” says Patricia Kramer, a professor of anthropology at the University of Washington. “We can’t tell what it is because it’s so grainy and dark. I mean, I don’t know what it is,” she says. But not all scientists so readily dismiss the possibility of a Sasquatch. Idaho State University Professor Jeff Meldrum first saw the Bigfoot film when he was a kid in Spokane. That planted the seed for his career in anthropology. But it wasn’t till 1996 that he got really hooked. He found a fresh set of muddy tracks in the foothills of the Blue Mountains, near Walla Walla. The details were astonishing. As he made casts of the footprints and took in the dynamics of the motion that must have created them, he says the hair stood up on the back of his neck. He came to the conclusion that he was in a place where a Bigfoot had walked, just that morning. He had seen a colleague (Professor Grover Krantz) ostracized for researching Bigfoot. But Meldrum made up his mind to risk his career too, because he was so convinced by the evidence he was seeing. Professor Patricia Kramer in a classroom where she teaches anthropology at the university of Washington. She tells her students there is no real evidence to prove existence of a Sasquatch, "it's fiction." Photo by Bellamy Pailthorp. Still, for skeptics like UW Professor Patricia Kramer, the plaster casts are just as murky as the old film footage. And as for all the reported sightings of Bigfoot every year? She thinks people just like to believe. And for writer David George Gordon, having the Sasquatch as a kind of wild-man alter ego fits right in to the culture of the Northwest, with all its mysterious rainforests and unexplored wilderness. Modern science may soon be able to prove once and for all whether Bigfoot exists. A lab in Texas is working on DNA testing of alleged Sasquatch samples. The results are expected any day now. But no matter what they show, the stories of a hairy wild man hiding in the woods of the Northwest are likely to endure. Jane Goodall: (Bigfoot) I'm sure that they exist. 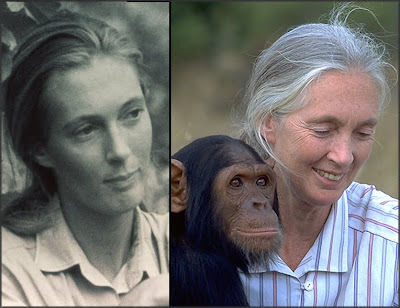 What most people may not know is Jane Goodall is on record for believing in Bigfoot. below is an audio and transcript of the Friday, September 27th, 2002, Interview. This Interview was conducted on National Public Radio's (NPR) Talk of the Nation: Science Friday with Ira Flatow, Dr. Jane Goodall made a striking comment on her strong beliefs that large "undiscovered" primates, such as the Yeti or Sasquatch, do indeed exist. Dr. Goodall: As for the other, you're talking about a yeti or bigfoot or sasquatch. Ira Flatow: Is that what he's talking about? Ira Flatow: Is that the message I'm missing here? Ira Flatow: (To the caller) Is that right? Ira Flatow: (Laughing) I'm out of the loop. Go ahead. Dr. Goodall: Well now, you'll be amazed when I tell you that I'm sure that they exist. Dr. Goodall: Yeah. I've talked to so many Native Americans who all describe the same sounds, two who have seen them. I've probably got about, oh, thirty books that have come from different parts of the world, from China from, from all over the place, and there was a little tiny snippet in the newspaper just last week which says that British scientists have found what they believed to be a yeti hair and that the scientists in the Natural History Museum in London couldn't identify it as any known animal. Dr. Goodall: That was just a wee bit in the newspaper and, obviously, we have to hear a little bit more about that. Ira Flatow: Well, in this age of DNA, if you find a hair there might be some cells on it. Dr. Goodall: Well, there will be and I'm sure that's what they've examined and they don't match up. That's what my little tiny snippet says. They don't match up with DNA cells from known animals, so -- apes. Ira Flatow: Did you always have this belief that there., that they, that they existed? Ira Flatow: (To the caller) Alright? Ira Flatow: Thanks for calling. (To Goodall) Well, how do you go looking for them? I mean, people have been looking, right? It's not like, or has this just been, since we don't really believe they can exist, we really haven't really made a serious search. Dr. Goodall: Well, there are people looking. There are very ardent groups in Russia, and they have published a whole lot of stuff about what they've seen. Of course, the big, the big criticism of all this is, "Where is the body?" You know, why isn't there a body? I can't answer that, and maybe they don't exist, but I want them to. Breaking news regarding evolutionary tree of life, especially when it comes to hominids. we already brought you A Planet where Ape Evolved from Man? NPR picks up where we left off. You can read the article by Christopher Joyce here. Embedded below is an audio interview with the discoverer of Ardi. Want to learn more about Ardi? Want to learn more about Lucy?